i think that says happy halloween. that's what it's supposed to say at least. unbeknownst to matt and me, we live in a pretty swingin' part of hong kong. 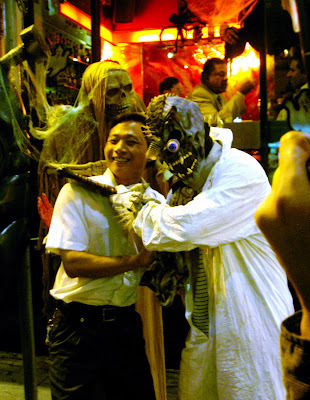 we went out for dinner on halloween night and got wrapped up in a huge costume parade, laced with cops and everything. i don't think they do the "trick or treat" gig here, but our chinese brethren really like to dress in costumes, they love seeing children dressed in costumes, and they absolutely love taking pictures of people in dressed in costumes. i haven't seen many small children here in the city, so maybe seeing kids in central hk is just a novelty in itself and warrants a photo opportunity. and thanks to the magic of computer technology, our halloween decorations. this is one of our favorite holidays, so matt and i just wanted to set the precedent early on in eggroll's life that on halloween, a burton dresses up. That is a cute little pumkin you have. I love seeing your cute belly. I had no idea Halloween is a big celebration in HK. You look fabulous!!! What a cute little bump. 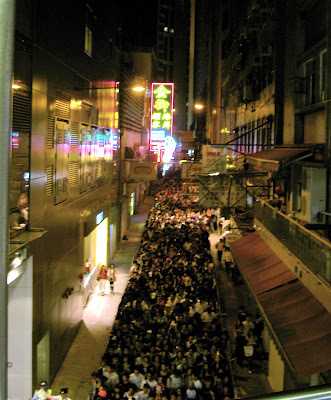 I love all of the pictures of HK you're posting, especially your descriptions of events. Love you guys! 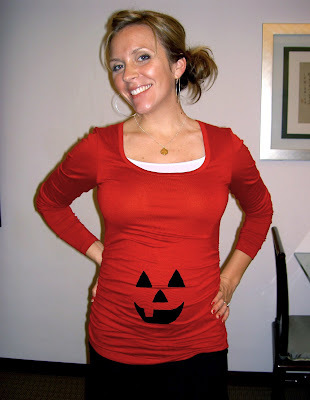 that is the most adorable shirt, and you have cutest pumpkin ever:) that is crazy about all the parades and such, looks like mad chaos there! I had no idea they celebrated Halloween in Hong Kong either! Looks like fun! i love that you were able to partake in some halloween festivities! and your lil' pumpkin is so stinkin cute. i love that shirt. i love that matt loves halloween. i just love it all. big, big love. You look so good! I love the pumpkin belly. I love how much I am learning about HK. That is funny! I was wondering if they do the whole Halloween gig in China! The belly is the perfect pumpkin sized! Cute little belly! Did your tummy get cornered and snapshotted by the Chinese paparazzi? i just found your comment and i cant believe you and matt are in hong kong and that you are pregnant!! i am so behind! i will add you guys so i can check up on you regularly now. josh is the real blogger of our duo, but i intend to put more energy into it soon...congrats and give matty my best!! That is hilarious. I haven't posted our halloween shots yet but we had identical costumes in reverse. I had a black shirt with orange felt face. Nice!!!! You of course look adorable. Hey this is Jeremey i saw that my wife left a comment below! That is awesome that you are experiencing Hollidays in HK can't wait for Christmas pics. Hey does matt's cell phone work there? And send me his email address! Interesting Halloweenie scene in China. Love your lil pumpkin. THat is so cute, you look great too! Hope the China experience is going well. Love to see the adventures on the blog. So you are right guitar hero, right up our white trash rockin' alley. Thanks for the recommendation. 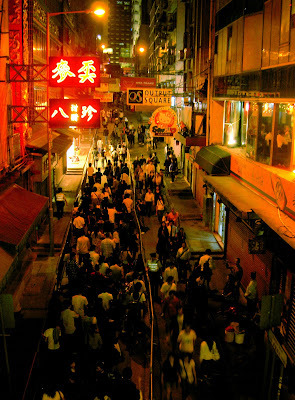 All your HK pics give me anxiety! I thought living in Ogden was crazy!! You look great being prego, and it looks like you too are having fun. erin you are possibly the most gorgeous pregnant woman ever. 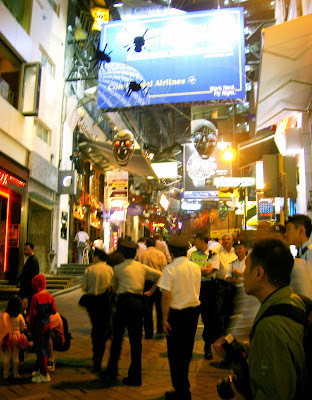 hong kong is looking like a sea of interesting experiences! i hope it is treating you well. can't wait to read more!